Hey, look! It's TV celebrity John Schneider from such shows as the Dukes of Hazzard and Smallville! This picture makes it obvious that Mr. Schneider is a huge fan of Teddy and the Yeti. Well, okay - all it proves is that he reads Teddy and the Yeti. All right - okay! All it proves is that he was coerced into taking a picture holding the book in a manner that made it look like he was reading it. Fine! Geez. This all came about thanks to my friend (and yours) Larry, who is not only an avid supporter of T&Y or a dedicated co-star of Internet sensation Franks and Beans, but also probably the biggest Dukes of Hazzard fan on the planet - and that's no lie. Larry has one of the most impressive (or disturbing, depending on your point of view) collections of Dukes material that you're likely to see, and he wasn't about to pass up the opportunity to spend some time with John Schneider, who was in town attending Pittsburgh's Steel City Con, a toy and pop culture show. Larry was able to take a few issues of Teddy and the Yeti with him, and managed to make plans to get the book in a number of stores that otherwise hadn't had any copies, including one from Canton, Ohio. Unless I'm mistaken, I think that this comic store (I'm still waiting to hear the store's name) will be the first to carry the book in the entire state of Ohio, which is a little distressing seeing as I have a number of comic book reading friends from Youngstown. Why can't they be as reliable and as selfless as Larry? Perhaps we'll never know. Mr. Schneider got hold of Teddy and the Yeti's second issue - and I'd like to make the offer right now (I've mentioned his name so often in case he has a habit of Googling his name, which I've never been known to do): if he wants the first issue (or the third, for that matter), I'd be happy to mail it to him. He doesn't even have to pay for them! That's right, people, if you are a celebrity, you don't have to pay for stuff! Why is that? They're the ones who can easily afford stuff! Oh well, I guess that's just another one of the many ironies of life. It's time once again for a barrage of news-like items that probably don't deserve their own singular topic. THIS IS WHAT YOU LIVE FOR, PEOPLE! Or...something like that. Let's get started, shall we? 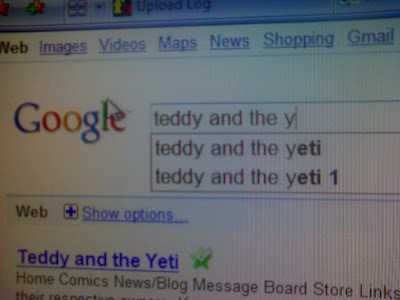 - The floodgates have opened at Google.com, where there are now two suggested phrases waiting for you when you begin to type "Teddy and the Yeti". The newest edition to the family is "Teddy and the Yeti 1", which gives me a better idea about how Google's suggestion engine works. I can't imagine that many people are actually searching for something like that, so it must suggest terms based on how many results are available. There are lots and lots of websites that have the solicitation information to issue #1, so I'm assuming that's why this all took place. There are hardly any sites listing the solicitation information for issue #2, which is something I have to work on. 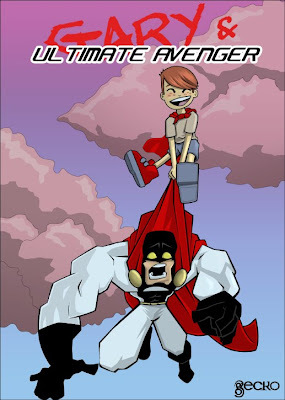 Haven Distribution is taking a while in getting the solicit into their system, so hopefully once that is done, there'll be a few more hits for "Teddy and the Yeti 2". - I recently conducted a quick interview with issue #3 cover artist Tom Scioli. Tom's responses will be published in the aforementioned issue, just as Phil Hester and Todd Nauck had interviews in the two previous books. Tom lives in Pittsburgh, but is originally from Philadelphia, so I asked him about his sporting allegiances. Who you root for is a big deal in the 'Burgh! People live and die black and gold, except when it comes to the Pirates, who have been so enormously mismanaged in the past 17 years that they've lost all relevance (which makes me cry a little). I don't think he thought it was a particularly good question. 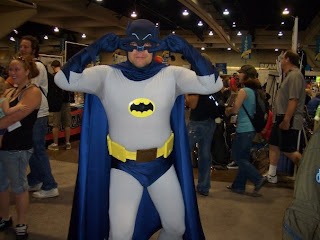 - The folks at the Pittsburgh Comicon have updated their guest list once again, and this time they've gone ahead and added a picture to my listing (at my request, of course). This is one of my favorite images of the Yeti, because it looks like she's frightened of whatever is right next to her. In this case, it's my short comic biography. Also, they hotlinked the homepage! So now lazy people can just click on the link, as opposed to all the work it would have taken to both copy AND paste or, perish the though, RETYPE the url in the address bar. Hooray! In case anyone was wondering, yes, I'm still listed directly above Scott McDaniel. - The Lawrence Public Library (located in...um...Lawrence) now lists Teddy and the Yeti's first appearance in Josh Howard Presents: Sasquatch in their online library catalogue. If you're anything like me, and you enjoy seeing other people randomly reference my name, just click on the link and go crazy! I also think it's funny that they spelled my name correctly, but refer to Duane as "Duan Redhead". Are there really people named "Duan"? - "Someone" has listed an autographed copy of Teddy and the Yeti #1 on eBay. According to the counter, people are actually looking at the page! According to the bid history, no one has actually committed to buy it yet! Perhaps they're just waiting for the last minute...um...yes, that's it. Only two days left, people! And speaking of eBay, I recently suggested that others buy copies of Captain America #602 (the "Tea Party" issue) and list them on the auction site. Taking my own advice, I did all right for myself. 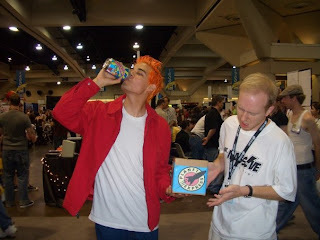 I sold four books and, after costs, shipping and eBay/Paypal charges, I made a net profit of...let's say eight bucks. YES!!! - Teddy and the Yeti has once again made it to someone's Twitter account. 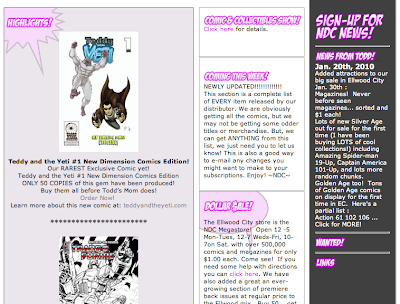 Adding Teddy and the Yeti to the Collectorz Comic Database is apparently news! I'll take it. - Lastly, here's something that has nothing to do with anything. However, I have been added to YouTube in a manner other than Franks and Beans and it MUST NOT GO UNDOCUMENTED! I'm currently teaching a public speaking course - students in the class are now presenting their informative speeches. One student asked to use me as a subject for his Photoshop lesson, to which I agreed only if the picture could involve me getting punched in the face (what can I say, I enjoy physical humor). Below is the result, and if you follow the direct link to the YouTube site, you can see instructions to duplicate this photo manipulation tool - so the video might actually make sense rather than just consisting of a fast moving cursor and a remixed "Jurassic Park" theme. Who decided to remix the Jurassic Park music?? Strange. This is just one more way in which I am slowly taking over the Internet(s). Yesterday I posted the Ms. Monster half page ad that will be printed in Teddy and the Yeti #3 - here's the other half! 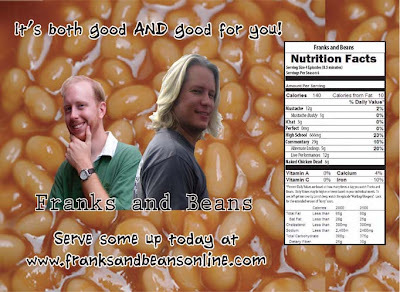 I've posted about - or at least cryptically referenced - Franks and Beans on previous occasions, but it bears reiteration here: anyone reading this blog should go to the F&B website and watch the videos contained therein perhaps dozens and dozens of times. The ad at top takes a number of its cues from our as-of-yet unposted 40th episode - we've had some problems uploading the thing to both YouTube and Funny or Die, but Larry (my co-star) and I hope to have those resolved by the time issue #3 hits the stands. Larry has told me that he plans on coming to the New York Comic Con with the Wagon Wheel Comics crew (me and whoever else decides to come along, basically), and it'd be great to have a DVD of the series there for people to check out. Some of you may be asking, "Jeff, I'm interested in seeing what Franks and Beans has to offer, but I am much too lazy to click on links. Why don't you just embed a video on this site?" Why, various reader, you have quite the point! I think that's what I'll do - and to make sure I put my best foot forward, I'll show what just might be my favorite episode of all time, #12 - "Mailbag/Bloopers". Enjoy! Ads have always been a part of comics (they fostered my love of sea monkeys), and as I've said before, one of my greatest thrills in putting Teddy and the Yeti together is selecting a few ads to put in each issue. I don't want to overdo it, of course, as I'd rather reserve most of the space for...you know...comics...but there are always a few things I want to show off to the world that don't fit in otherwise. One is, obviously, Franks and Beans (new episode up today, kids), but I'm not always so selfish or at least self referential. Issue #1 had an ad for Digital Webbing's Fist of Justice as well as a big, back cover ad for the Hero Initiative - which allowed me to say "hey! 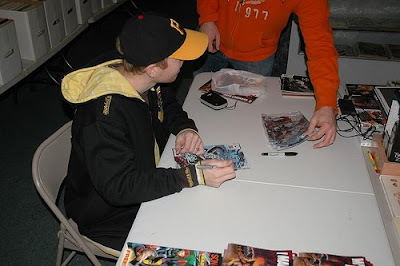 Captain America is in my book!" and not be a liar about it. Issue #3 gives me the opportunity to toss in the above ad for Ms. Monster and her website. 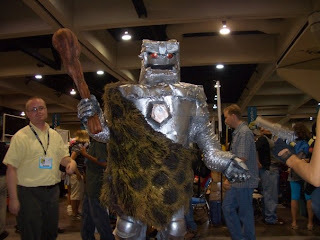 I first met Ms. Monster and the B-Minus crew at 2006's San Diego Comic Con International, where we had booths side by side. The group works together on a television show that airs in San Francisco (and if I'm not mistaken, they were on at one point in Salem, Massachusetts). Ms. Monster is something of an Elvira-style throwback character, reminiscent of "Chilly Billy" late night horror movie hosts, and her enthusiasm for her craft (as well as, uh, guts and entrails) really shows through in everything she does. Beyond all of this, she and the others are AWESOME, so that should be reason enough to check out her website and browse through the wares. I've got volume one of the show's DVD set, and it looks like volume two is up and ready to order. 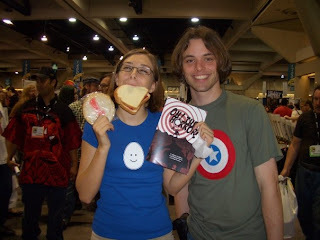 The picture below is from the '06 San Diego Con - if you can manage to look past the blue woman in the center, you'll see on the left someone, his mouth agape, holding up a copy of Mr. Massive #1 - that would be Ratha, the artist and co-creator of Mr. Massive. 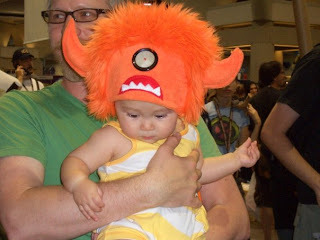 As people were snapping pictures (including this one, which later showed up on Ms. Monster's website), Ratha said "hey, free advertising!" and shot his arm up just in time to get this ridiculous result. I'm not sure if anyone other than me ever noticed this when looking at Ms. Monster's pictures, but perhaps that's why I find it so funny. As an aside, I really like Ms. Monster's blue and orange color scheme. Karin Rindevall recently sent me the colored version of the cover to Teddy and the Yeti #3! How Kirby-esque! Pencils for this beauty are by Tom (Godland) Scioli with inks by Alan Gallo, who drew the New Dimension Comics version of T&Y #1. In the meantime, I am hard at work at actually putting issue #3 together...so I'm going to get back to that. The end. 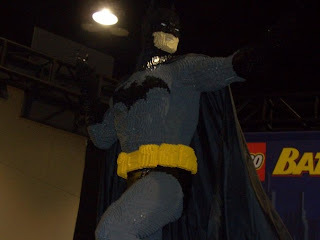 One of the co-creations that I feel most fond about has to be the "Ultimate Hero". Unfortunately, it is also one of the most frustrating. 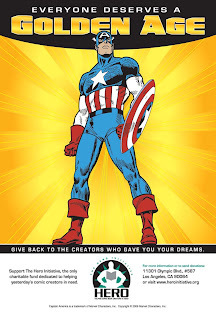 The Ultimate Hero began as the Ultimate Avenger - it's since changed for obvious reasons ("satire" gave way to "blatant copyright violation" once Marvel actually released a book titled "Ultimate Avengers"). Mike Adams and I developed a story where an egotistical jerk of a super hero had his powers taken away - transferred to an eight-year-old boy - to teach him a lesson in humility. The result was one of the funnier, more complete stories I think I've ever told, but trying to get this concept off the ground has run into any number of speed bumps. More than once we've been told that the project had been picked up for publication, but each time the fates conspire to stop production in one phase or the other. Even though I manage to get my heart broken every time, I still hold out hope that one day - one day! - the right situation will come along for UH to see the light of day as an actual series. The page you see posted above is from Teddy and the Yeti #3 - the Ultimate Hero plays the role of the second feature in this issue. 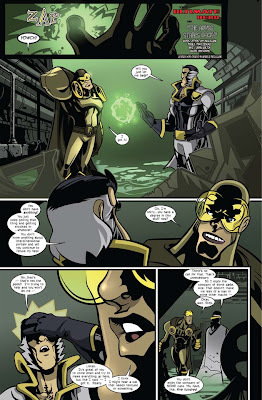 Occurring before the events in the proposed series take place, this short story lets loose one of my favorite aspects of the UH story - Ultimate Hero and his contempt for the old-school super hero "Super Supreme". The art is by super Canadian Travis Sengaus, who has a flashy style that really suits the story. Travis at one time was working on an actual issue of Ultimate Hero...maybe one day I'll be able to twist his arm enough to continue. For now, though, I'm just happy to get the concept to print, even if it's just a short story in the back of Teddy and the Yeti. Small steps. As part of Teddy and the Yeti #2's release, I was able to take the book around to a few Pittsburgh area stores, stopping to sign some copies at Evil Genius Comics in California and New Dimension Comics in the Century III mall. The turnout was light at times, but the overall flow was good - I managed to not only sell some books (including a copy of the hefty Josh Howard Presents: Sasquatch and a few copies of the NDC exclusive #1), but I got to have some good conversations with fans who ventured up to the table at both locations as well. It was even more satisfying to hear from people who read issue #1 and were back for more. Hooray, the book has followers! My thanks go out to the proprietors of the two shops, who continue to be more than generous in giving me the space to show off Teddy and the Yeti. Evil Genius and New Dimension Comics - all five locations, at least as soon as copies are split up - have plenty of copies on their shelves right now, so if you weren't able to make it to the stores this weekend (all six and a half billion of you, roughly), there's still time! UPS had me worried all of Thursday and Friday morning, but they came through in the end - Teddy and the Yeti #2 was delivered at 10:40 AM on Friday morning, and the result is as seen above. The books themselves look great - the pages are crisp and both the front and back covers (T&Y by Duane, Mr. Massive by Todd Nauck) came out really well. I've spent the past few days taking copies around to various shops, signing a few at both Evil Genius and New Dimension Comics, and generally trying to get the word out. I'll have them for sale on the website within the next few days, and I'll send out creator copies before the week is over. It's a busy time but it'll all happen...promise! It's such a relief to get issue #2 out - not just because it took a lot of work to finish, but because having a second issue goes a long way to legitimizing the comic. In my opinion, anyone can put out one issue of a comic book - I'll go further and say that I think anyone can put out one GOOD issue, as well. Anyone can do the work and get an issue on the shelves, but it's going back and starting the process all over again that really separates those serious about the craft from those who can't quite cut it. The creation process is a long, difficult, lonely one, and I think that a lot of creators expend all of their creative energy on one issue, leaving nothing left for a second. If I had to guess, I would say that getting an issue #2 completed and printed is the most difficult process in any series, let alone an independent one. I hope I'm not sounding like I'm full of myself, but I am really proud of getting this issue back from the printer. Hopefully it'll be successful, because just as anyone can PRODUCE a first issue, it's easy for anyone to BUY a first issue. How many people stick around for the second is a big indicator of if the story is any good. 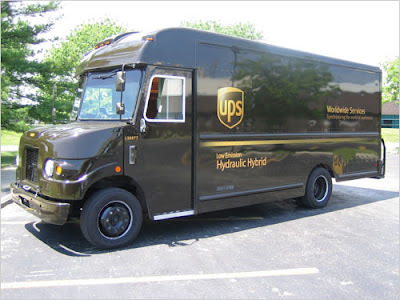 Teddy and the Yeti #2 is right around the corner (UPS's information tells me that it's been in New Stanton since 8:51 this morning. What is the hold up? Don't they know I will drive there to pick them up? Come on!) - and I've just set up a new signing at the Century III New Dimension Comics. NDC has a great presence in Pittsburgh, and the Century III store is pretty big - and it's got the curious distinction of being located in a mall, so there are plenty of passers by who have never read a comic book in their lives and thus give you the strangest looks as you try to sell them your comic...but perhaps that's just me. In any case, some of the smaller details still need to be worked out, but it looks like I'll be there on Saturday the 20th (two days away!) at 3:00 to...question mark. Don't you know that all the best parties end at question mark? Perhaps you should stop on by and see. Like an expectant mother, I just confirmed that Teddy and the Yeti #2 is currently being shipped from the Comixpress warehouse in New Jersey to my parents' place in Undisclosed Location, PA. UPS is making this...uh..."delivery"...so we can all wait in anticipation while this new...um..."addition" is making its way to the world. Okay, so the newborn child analogy only goes so far. I will be seeing an actual baby - my nephew Jacob - for the first time on this trip home, so maybe I just have that mindset right now. Anyway, the books got on the truck a little later than I was lead to believe, which means that I'll be pushing the envelope on my signing date with Evil Genius a bit. The books are supposed to arrive on Friday - I'll have a better idea tomorrow about whether the first signing, from 1:00 to 3:00 pm, is still feasible. The second, from 6:00 to 8:00, shouldn't be affected. 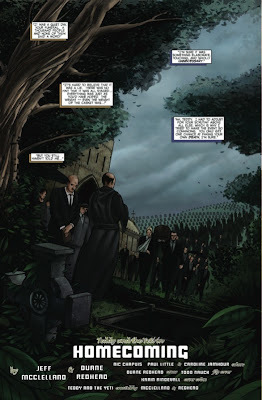 If you click on the following link, we can all track issue #2's impending arrival together! Marvel as Teddy and the Yeti makes its midnight journey across the Keystone State. Gasp in suspense as I push my commitments to the limit and try to get to the comic shop on time! If you time it right, you can show up at my parents' house and get the VERY FIRST copy out of the box! I hope that truck doesn't break down. 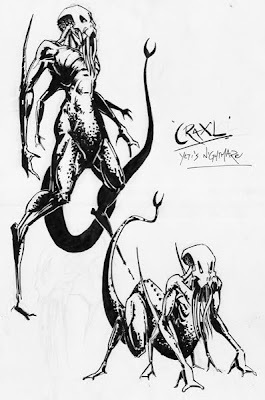 Yesterday I posted a clip of one of the stories to appear in Teddy and the Yeti issue #3 - I thought I'd stick to that train of thought and post Duane's initial drawing of the villain Craxl. This would work great as an extra feature at the back of the book (or - gasp! - in a trade collection), but I'm as always pressed for space...so I don't know if I'll have the opportunity. Thanks for giving me the space, Internets! 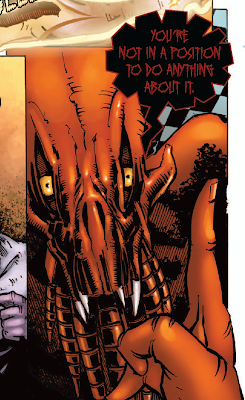 One of Duane's artistic strengths is drawing strange, frightening creatures - check out 2000AD #1575 and his zombie dog monsters for further proof - and I think he really outdid himself with this terror-inducing character. It really is creepy! The caption for the character sheet is "Yeti's nightmare", and that plays into the story, but regardless, it's a nightmarish design that manages to freak me out a little each time I see it. 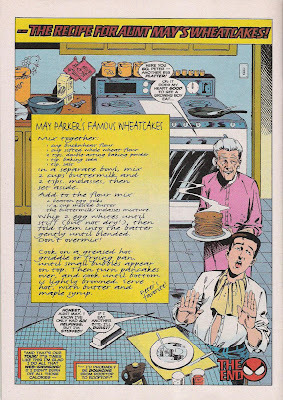 Lettering is one of those aspects of comic book production that people only notice if something is wrong with it. The average reader doesn't pay a lot of attention to it - but it's crucial nonetheless. I'm currently in the middle of lettering one of the short stories that'll appear in Teddy and the Yeti #3, and while trying to figure out what kind of speech balloon would work for the particularly hideous monster appearing within, I went to my handy source on all things lettering, Richard Starking's Comic Book Lettering: The Comicraft Way. If I had to judge my lettering skills, I would say that they are adequate - serviceable but not advanced or flashy. I decided to letter Teddy and the Yeti for two reasons: one, because it's my book and I can do as I please, thank you very much, and two, because it's cheaper in the long run (though buying Adobe Illustrator CS4 and several fonts isn't for the faint of heart). Comicraft's guide to lettering is an indispensable tool in this regard, and any "trick" I'm able to pull off is a result of this simple-to-follow 64-page book. 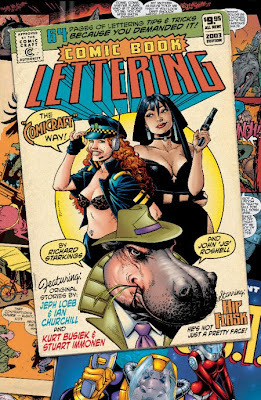 I highly, highly recommend it to anyone looking to take on the unappreciated art form of comic book lettering. Teddy and the Yeti #3 (one story within it, anyway) features the nightmarish villain "Craxl" (don't ask where I got the name from), and it was obvious that a regular speech balloon wouldn't do. One of the pitfalls of lettering is trying to come up with a fancy new font and balloon for each new character - I'm of the mindset that less is generally more - but I figured that Craxl merited the distinction. If you don't overuse it, it can be effective. The result can be seen on the picture to the right, and I think it works without causing a distraction. If anyone is interested, to create the balloon I made a simple ellipse shape, then converted it to guides. I used the pen tool to create the jagged edge, connecting the lines when finished. Some might prefer the edge to be uniform in its divots, but I think the random quality is an asset in this case. 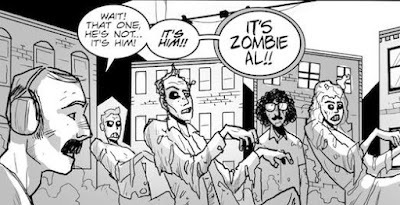 The font I'm using is "killcrazy BB" from Nate Piekos's Blambot site - Blambot is another great resource for letterers, as the site gives away free fonts by the bucketload. The pay fonts are well worth the price, too - Teddy and the Yeti's main font is called "silverage BB" and it has paid for itself time and again. The lettering process takes up so much time in the overall scheme of putting an issue together - if I was more skilled at it, it would go more quickly, to be sure - but it's something that I find myself enjoying, especially when I can look at the final product and be satisfied with the result. As we prepare for the whirlwind release of Teddy and the Yeti #2, the fine folks at Evil Genius Comics have set up another signing event at their store in California, PA, right next to the campus of Cal U. The previous time I was at the store, the response was great! We've set it up so I'll be there at two separate times, both on Friday the 19th, first from 1:00-3:00 and again from 6:00-8:00. Last time around, college was out of session AND Diamond didn't ship their regular comic run, so it'll be interesting to see how things work out this time around. I'm also hoping that some of the three feet of snow currently on the ground melts before, say, Wednesday of this upcoming week, as I have to travel through the mountains of West Virginia to get there. Maybe I'll just slide all the way down the Appalachians. Passive aggressiveness: just one more service the Internet has to offer! The Internet(s) is full of glorious, wonderful intellectual and social advances for all to enjoy. It's also a place to make fun of other people endlessly without fear of recourse. Franks and Beans has spoofed this idea (quite masterfully! ), yet people STILL haven't been shamed out of some of the baser instincts the Internet seems to bring forth. 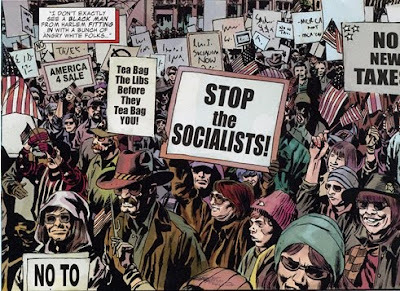 The newest example of this comes from the recent reaction to Captain America #602, in which an angry crowd similar to the "Tea Party" faction getting so much attention lately is portrayed. In this issue, Cap and the Falcon point out that the people protesting in this movement are extremists, and those involved and (gasp!) others at Fox News, assuming the two aren't one and the same, have taken umbrage with this depiction. Ignoring my own feelings toward these crazies fellow Americans, I was quite amused by a quote from Tea Party founder Judson Phillips, who lamented that "When I was a child in the '60s, Captain America was my favorite superhero. It's really sad to see what has traditionally been a pro-America figure being used to advance a political agenda." I can appreciate the nostalgia one can feel when a childhood hero grows up, but I appreciate even more the passive aggressiveness of the statement. One of the best ways to angrily shout at people across the Internet(s) is to pretend that something makes you sad. "It's sad but true that the Steelers are keeping their offensive coordinator even though they couldn't run the ball on third downs this year." Oh, ho hum. Woe is me! But wait! I'm actually making a calculated dig at a football coach - DISGUISED as a genuine lament! How clever! Oh, Internet(s). You never fail to disappoint me. 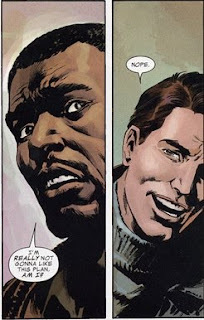 The idea that Captain America never promoted some kind of agenda is, of course, ridiculously false. How many World War II-era covers featured Steve Rogers beating up some Japanese stereotype? The cover to the first issue featured Captain America punching Hitler in the face!! 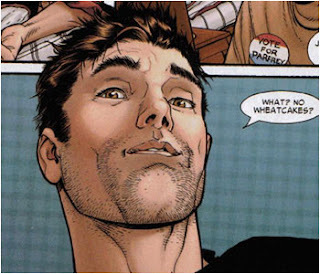 Naturally, as popular comic books have become institutions, there has been less risky behavior in their pages - we knew that Steve Rogers would eventually return after being shot to death by Sharon Carter, if for no other reason than because he's got a movie coming out soon. But to say that Captain America should never be controversial or take some kind of political stand is a bit outrageous. I'm sure Marvel isn't minding the publicity - no news is bad news, after all - but I wish that the company hadn't backed away from the book's statements so quickly. Look at me - I've been on some rants lately...and I genuinely try to steer clear of that in this context. I guess virtual space is getting the best of me. Anyway, tomorrow I'm off to the comic shop to see if there are any copies of Captain America #602 left, because they're selling on eBay for like twenty bucks a piece. I invite others to do the same (LARRY), but hurry up, because these things don't last long! Apparently, I am. 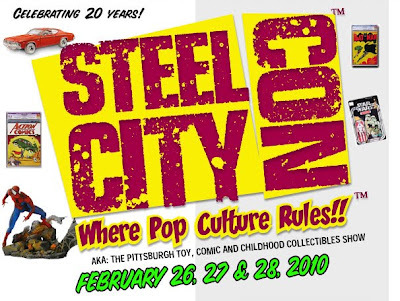 The Pittsburgh Comicon's website was just updated with more guests, including Pittsburgh's own Jeff McClelland, or as I like to refer to him, "me". The folks at the Pittsburgh con printed my bio exactly how I sent it - the odd part about it, though, is that they made the Franks and Beans link active, but not the one to the Teddy and the Yeti main page. The F&B line at the end of the bio was a late addition as it was...just to see if they'd add it. And not only did they, it's the one thing you can click on. Ah well. I'll try to get them to add a picture at some point, if that's at all possible. Perhaps people searching for Scott McDaniel will accidentally read the entry directly above his and then discover Teddy and the Yeti. I'll be curious to see if I end up in in the mailer that they send out each year - to be included, you had to have your information in by January 1st, and mine should have arrived as close to that date as possible. If they're just getting my info online now, though...we'll see. 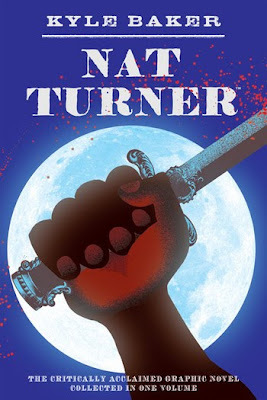 I just finished reading Kyle Baker's Nat Turner collection, a recently collected trade paperback retelling the title character's violent slave revolt in the antebellum South. My silent admiration for the book was recently overshadowed by the shocking news that the North Carolina state board of education is considering dropping all reference to the Civil War - all history before 1877, in fact - from their state mandated history curriculum. As I've only recently learned of this proposal, and I haven't read enough to understand if they're instead suggesting something more reasonable, like splitting American history into two sections - one until 1876, the other 1877 to present, for example - I'll try to withhold specific judgment other than to say that there's a reason that the quote "those who ignore history are doomed to repeat it" has stuck around all these years. I'm from the Pittsburgh area, but for the past few years I've been living in North Carolina, and I've seen more than a few examples of people who don't realize what an atrocity slavery was (not that I even have a great perspective on it) in American history. There are those who fail to realize just what was sacrificed for slaves to gain the limited amounts of freedom they were given in the aftermath of the Civil War, and there are those who don't understand how damaging, demeaning and degrading - both physically and emotionally - the act of slavery inherently is and was. 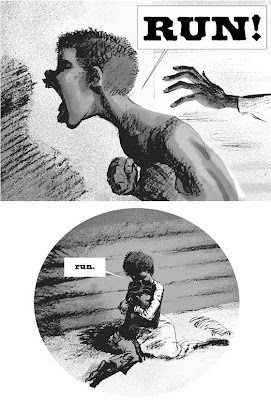 To those people, I would like to recommend a copy of Kyle Baker's masterpiece, all about the life of and, of course, revolt devised by Nat Turner. Years ago I read The Fires of Jubilee, so I was familiar with Turner and his story, but Baker so deftly illustrates (both literally and figuratively) the period surrounding slavery that Turner showed me sides of himself that I never knew, and perhaps never wanted to know, existed. This story is brutal, violent, and historically accurate in the most terrifying ways. Nat Turner is such a compelling figure, and one so difficult to understand. It would be irresponsible to condemn him for what he did - gathering a militia and slaughtering white slave owners, their wives and their children - but it's also difficult to look at him as a "hero", for those same acts were as depraved and as gruesome as those acted upon him and those around him for his entire (brief) life. I can't say that I am as well versed in history as I should be, or as any number of others are, but I can easily understand how socially significant Nat Turner was to the anti-slavery movement. Turner has been, for the most part, written out of the history books, surely because his story is so excessively violent. Just because history may not be as sanitary as we'd like to believe, though, does not mean that we should not learn it and try to learn from it - and Baker shoves Turner and his story back in front of us, no matter how unpleasant it all may be. His choice to present the story with minimal text was a stroke of genius. The solemn image of the layout of a slave ship at the book's end was equally as powerful. This book sells for around ten dollars. Do yourself a favor and buy it. Like Murderer before it, this one started with just a title. That's not always the case with my various projects over the years; sometimes the title is the absolute last thing I come up with. Every now and then, though, I do come across a cool word that I think makes a great title and that gets my mind racing on all kinds of interesting possibilities. As a matter of fact, other than Stealth [another one-shot issue], I think all of these Pilot Season concepts started in my head as titles. Maybe I do that more than I realize. 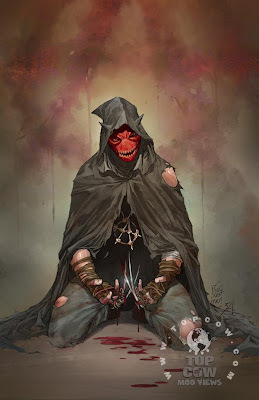 As for the Demonic issue in general...it was pretty terrible. My apologies to Mr. Kirkman and the rest of the talented people who worked on the book for saying so, but the issue basically contains the main character gruesomely murdering lots of people and then saying "WHYYYYYY?!" I'm generally a fan of Kirkman and his style of writing, but this issue was pretty much a slight tweak on what he's doing monthly in Haunt...which I am, honestly, not that crazy about, either. But Invincible, Walking Dead, Irredeemable Ant-Man, and Brit? Hey-ooooooo! 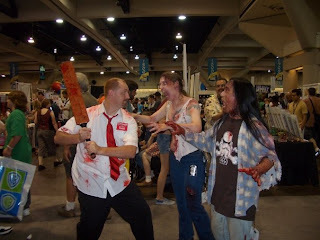 To continue the theme from yesterday, here's more pictures from San Diego's Comic Con International in 2006. 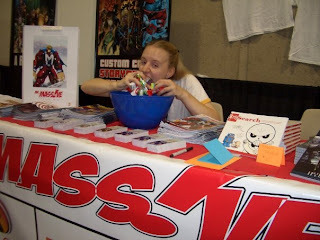 I spent probably a good hour today looking up pictures from previous New York Comic Cons, and if the Internet(s) is any indication, the two are fairly similar. 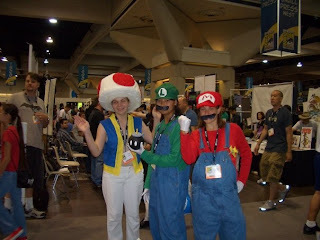 Lots of tv and movie stars, lots of costumes, lots of video game premiers, and lots of comics. I'm excited. Can you tell I'm excited? Well, I am. The New York Comic Con has been pretty much the only thing I can focus on since I found out that I'll be attending this year. Already, even though the show isn't for another eight months or so, I've contacted people about attending (Duane might make it after all!) and have started making plans on what to take. Since October is football season, and the Steelers play the Jets at some point, I've started making contingency plans in case the game is in New York and the Steelers just happen to be there that Sunday (unlikely). 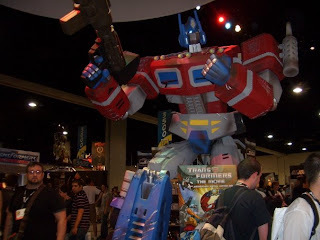 The only experience that I might find comparable to this upcoming show is San Diego's Comic-Con International that I attended in 2006...so in honor of that, I thought I'd post some pictures from that show. 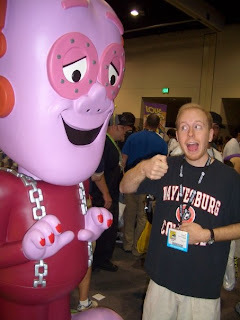 It was lots of fun, as if the picture of me and Frankenberry didn't quite illustrate that well enough. Teddy and the Yeti #1 NDC exclusive now on sale online! I've talked a good bit about putting together a exclusive edition of Teddy and the Yeti #1 for the Pittsburgh-based New Dimension Comics. The issue, with a cover by Alan Gallo, has been on sale at the physical store locations for about a week now. Starting today, though, you can also order a copy directly from the NDC website! The book gets a good location on the page (take that, Transformers! ), so hopefully people will see it and maybe...just maybe...order a copy. I'll get around to putting a link on the main website's store as well...it's about time I updated the store page, anyway. Our RAREST Exclusive Comic yet! Teddy and the Yeti #1 New Dimension Comics Edition ONLY 50 COPIES of this gem have been produced! Buy them all before Todd’s Mom does! Learn more about this new comic at: www.teddyandtheyeti.com. $9.99. $7.00 to ship inside USA (up to 15 copies). $15 outside the USA. 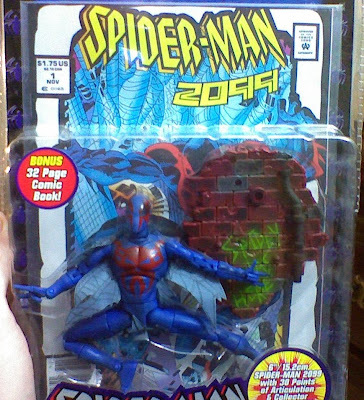 After literally years of trying, I was finally able to find and purchase the above Spider-Man 2099 action figure. I'm not a big collector of action figures, per se; the reason I searched for this figure was because of the comic that comes packaged with it. While I'm relieved to at last have this in my possession, there's a part of me that shakes his metaphysical head in disbelief. The comic is nothing more than a reprint of the first issue of Spider-Man 2099; the only differences are the ads inside and the border - the red foil from the first edition is replaced by this more generic solid white. The story is exactly the same. Exactly! And I have the first edition, along with the more recent reprint in the pages of Amazing Spider-Man Family. But still, I had to hunt this edition down and pay for a figure that I'm ambivalent about just to get the afterthought packaged as a bonus. By getting this issue, I only have one version of issue #35 to get (which introduced Venom 2099) - at that point, I'll have every issue of every 2099 series published. I wonder if they'll give me a prize when I manage to get it. 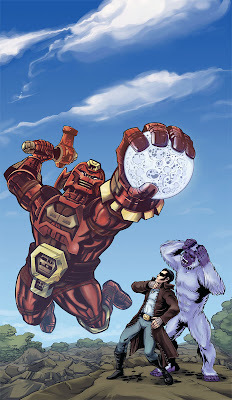 I would like to point out that the main website has had this preview of the soon-to-be-released Teddy and the Yeti #2 online for more than a week now...but I realize that not everyone checks that as it's not updated nearly as often as I post some random thing to this blog. 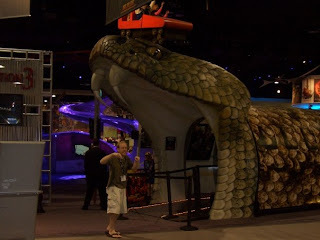 Heck, I also realize that not many people check the blog, either, but you know what? I do what I can. 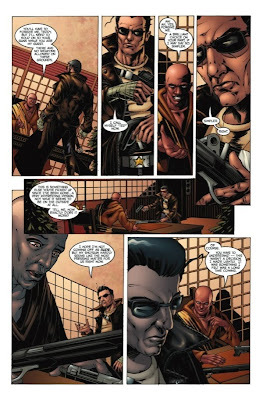 Anyway, here, for your eager eyes, is a four-page preview of issue #2. I was going to say "exclusive preview", but I guess it's also on the main webpage, and hey...if anyone wants to spread this around and make it not as exclusive, then you have my blessing. Just click on the pictures for larger images that you can actually read! For those of you who haven't read issue #1 yet (what?! ), this preview contains MAJOR SPOILERS. Seriously, read #1 before you check this out. 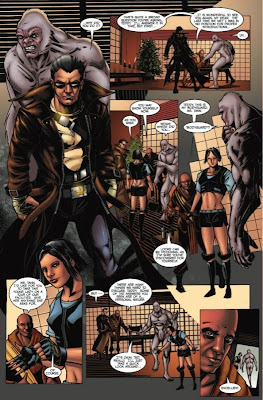 All of the pages (including the cover) are pencilled and inked by Duane Redhead. 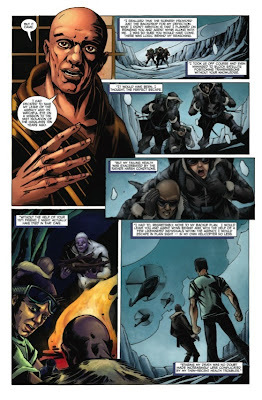 The cover is colored by Karin Rindevall, pages 1 and 4 are colored by Caroline Jamhour, and pages 2 and 3 are colored by Paul Little. This issue features a "flip" cover by (and interview with) Todd Nauck and a short Mr. Massive story with Paul Tucker. Now post some comments!! As the Yeti fights for her life, Ted is locked in a battle of wills with a former friend as the mystery of the dragon's tooth is revealed! Who is building a cybernetic army based on Ted's design? Plus: Mr. Massive with Paul Tucker and a "flip" cover by Todd Nauck!